Car 2 finishes at 9th in accumulated overall rankings. crew has a trouble-free race to the finish line. Monday, Jan 14: This day, the race was based out of San Juan de Marco on a 323 km loop course with road surfaces mainly featuring soft sand and fesh-fesh (sedimentation of extremely soft and powdery soil). The course was very difficult to drive on and proved to be one of the major obstacles of the second week. Foggy conditions prevailed in the inter-mountain areas in the morning, causing a 30-minute delay in the liaison course start time, and a 20-minute delay in the SS (Special Stage) start time for the cars and trucks categories. 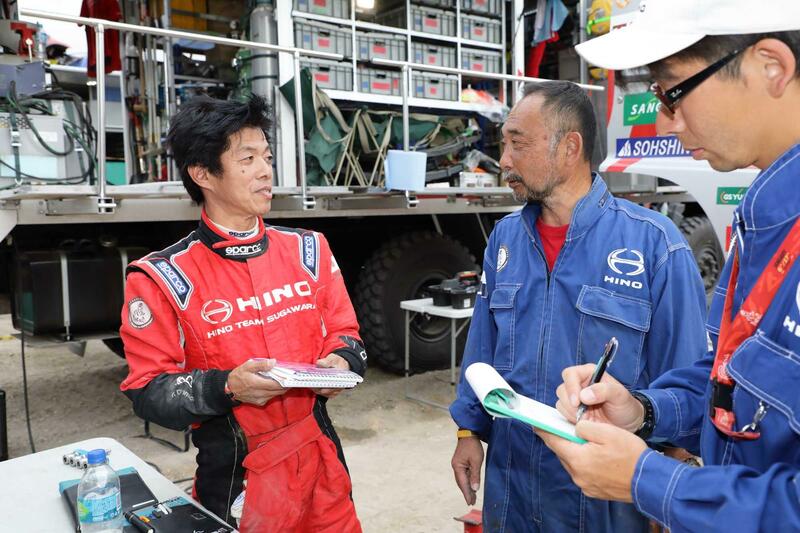 HINO TEAM SUGAWARA's Teruhito Sugawara and Katsumi Hamura duo, the 22nd racers out of the gate, maintained their composure as they drove across the dunes which are their forte. Midway through the segment at the 100 km point, their front-right tire blew a flat when it was slit from a rock hidden in the sand. While this tire change cost the crew about 18 minutes, they followed through with a trouble- and error-free race to the finish line, coming in at 9th in the overall trucks category. They are now at 9th in accumulated overall rankings. 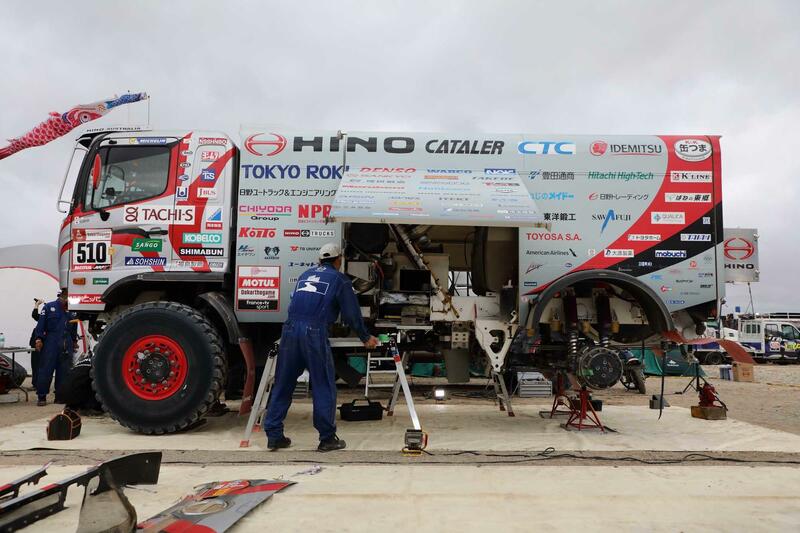 Meanwhile, the Yoshimasa Sugawara and Ahito Sakurai crew of HINO500 Series Car 1 raced in the Semi-Marathon, a classification where contestants who were forced to withdraw in the early stages were given a chance to race the second half of the race. In yesterday's SS, the crew stopped after CP (checkpoint) 2 as the sun had already set by then. They set out again at the break of dawn and arrived safely at the bivouac in Marcona at roughly 8:10 am. 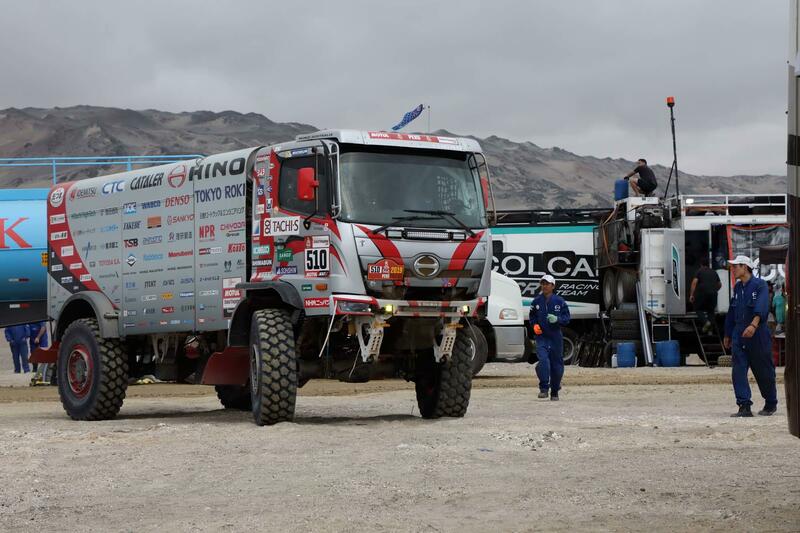 The truck underwent about 40 minutes of simple inspections and servicing, and the crew showed no sign of fatigue as they took off for the starting line for Monday, Jan 14. They started out of the SS at 10:56 am and passed the 150 km point at about 5:00 pm. The truck has yet to arrive as of this writing at 9:00 pm, but appears to be on the road without encountering any problems. 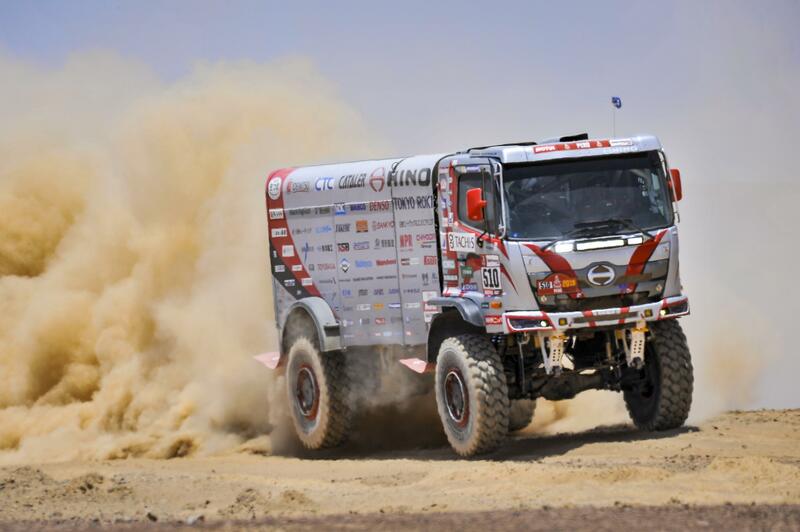 On Tuesday, Jan 15, contestants face 359 km of racing in dune areas on their way from San Juan de Marcona to Pisco. We were extra cautious because we knew there were rocks in the sand, but we ended up flatting a tire and losing time. You have to be extremely skillful with your driving even on dune areas that you have previous experience driving over. 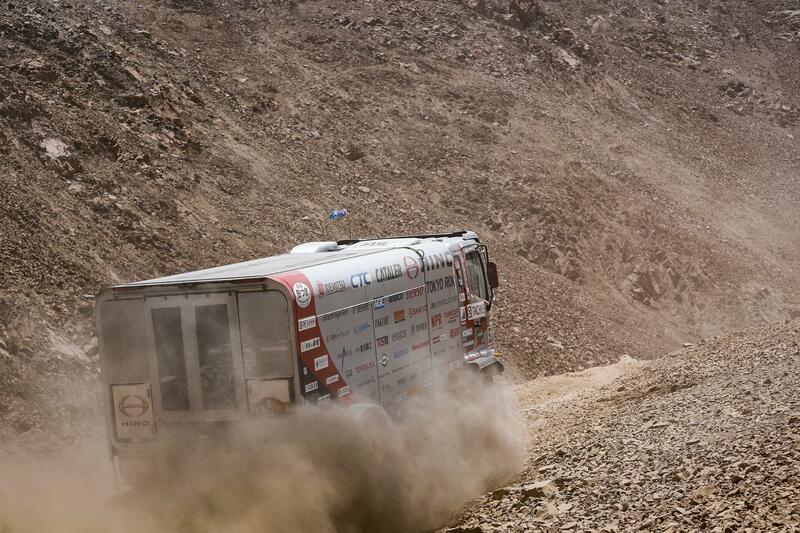 This was a tough stage where we couldn't increase our average speed. The race to Pisco won't be easy either. I will continue to do my best. There have been overlaps in the areas that were set for the race, and there were parts today that we were driving through for the third time. There were a lot of ruts from previous days so we made sure not to misidentify them as we drove. The dunes were undulating and difficult, but I'm relieved that we were able to reach the finish line without making any errors. Mechanics guide Car 2 upon its arrival at the bivouac. Car 2 is being serviced at the bivouac in Marcona. A mechanic cleans Car 2's rear hub.